Desire Maximum Current Rating of Bus bar =630Amp. Fault Current (Isc)= 50KA ,Fault Duration (t) =1sec. Operating Temperature of Bus bar (θ)=85°C. Final Temperature of Bus bar during Fault(θ1)=185°C. Temperature rise of Bus Bar Bar during Fault (θt=θ1-θ)=100°C. Maximum Bus Bar Temperature Rise=55°C. Total No of Circuit= 3 No. No of Bus bar per phase is 2 No’s. De rating Factor is 1. Bus bar Phase Spacing (p) is 400mm. 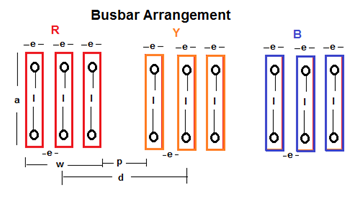 We have select 2 No’s of Bus bar per Phase hence. Actual Bus bar Size is Less than calculated Bus bar size. Size of Bus bar = 2No’s 75x10mm per Phase. Total No’s of Bus bar = 6 No’s 75x10mm for Phase and 1No’s 75x10mm for Neutral. Now a days New version of technical pirating is discovered. Not only New Technical Blogger, some Technical Service provider Company also start copy past of this blog and put these contains on their official Site !!!!!!!!!!!!! Look at following totally copy past material of this Blog which published on Official site of Lighting Protection Solution provider Company . Company does not even care to change The Color and Style of the Font during copy past. This post is published after lot of mail posted to above company to remove pirated contain but Still no any action taken from company !!!!!!!!!!!!!! !